Greetings from day 3 of Zamo’s incarceration on The Big Island with Technical Support Monkey, because Georgie is partying in Montreal and doens’t trust Iggy to not steal her stuff and redecorate her house if left unsupervised. There’s no TV and Technical Support Monkey doesn’t seem to know any monkey tricks to entertain Zamo, so Iggy’s understandably bored and irritated. Annoyed by Georgie parading around in short shorts and a bikini top, Zamo invites Mr. Hydell to come over and be a perv. 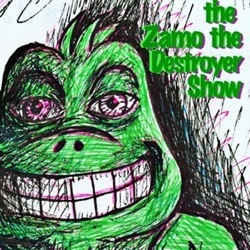 Zamo then goes to Wal-Mart with Georgie and Technical Support Monkey, who has some weird neurosis about graph paper and insists she makes her money in the stock market and totally not as an online cam whore.